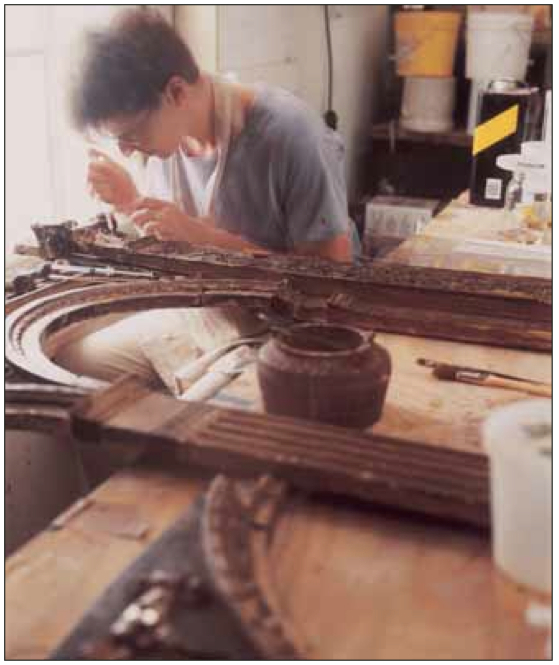 In the early 1990s the frame historian Paul Levi retired and sadly gave up his prestigious London workshop, which had been in operation for over 50 years. Shortly after this, in July 1992, two large crates arrived at my workshop, Gold Leaf Studios in Washington DC. It was not until the crates were opened that I realized what hidden treasure was waiting within. Before me, in the sweltering heat of my dusty Chinatown warehouse, were the components of one of the largest 15th century frames I had ever laid eyes on. I felt like Indiana Jones. As an added bonus, the frame – although 500 years old – was in a completely untouched condition, having been spared the usual mistreatment at the hands of restorers. Paul Levi had sent it to me in the hope that I might be able to discover the missing paintings which had once filled this great shell, and reunite them all. If I couldn’t find the paintings, he authorized me to sell the frame to an individual or an institution which would appreciate such a fine example of the framemaker’s art. I knew at the time that it would be a long shot to find the original paintings, but I thought that I might perhaps find a decent home for the frame. It was an orphan, yet it was just too beautiful an example of Renaissance workmanship to be discarded… although finding the right home for it would be a challenge, to say the least. The frame was dirty and damaged, as you would expect in an object of that age. Parts of the ornamentation were missing, and areas of the wooden structure had fractured; but here and there, beneath the overhanging mouldings where the dust couldn’t settle, the gold leaf had remained untouched by time, still reflecting a soft light from its recesses. Armed with the enthusiastic zeal of youth, I began the hunt to find the eleven paintings once contained in this Renaissance polypytch . 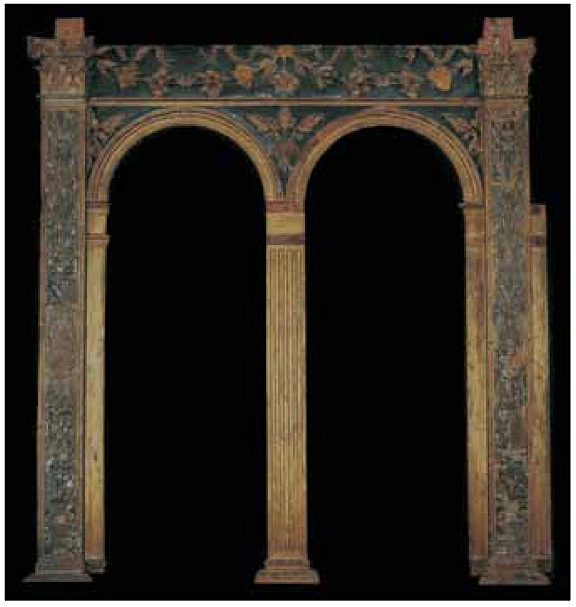 But as I researched altarpieces from the same general region and date of fabrication, I found very little which was comparable to my frame. This piece was so rare that not even – for example – a work such as Bartolomeo Vivarini’s altarpiece in the Getty Museum (Polyptych with St James Major, the Madonna & Child and Saints, 1490) still possessed a frame of quite this quality and condition. 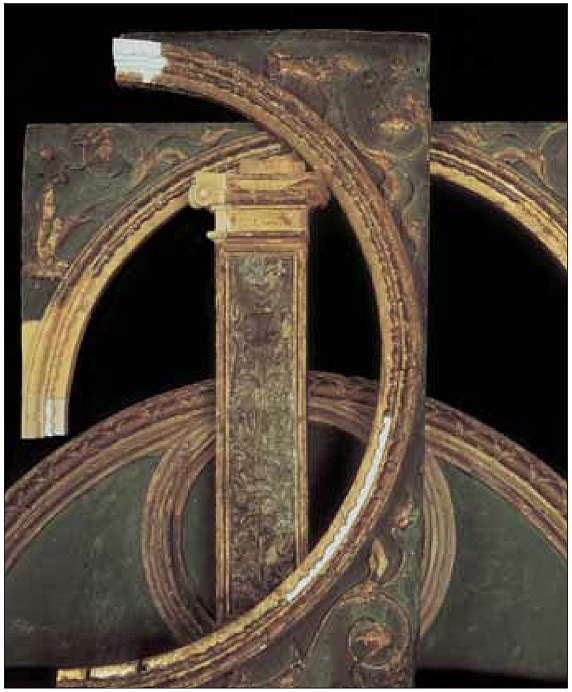 In fact, on further investigation, I found that many of the polyptych frames in Venice, Florence, and other museums throughout Italy had, like the Getty’s, been systematically regilded as a matter of course throughout their history, radically altering the way they would have looked after five hundred years. The polyptych frame had been acquired by Paul Levi in 1967 from a now defunct auction house in London. It had been sold in fourteen pieces; that is, all the individual components had been taken apart in order to be auctioned. It would take some imagination to think about what to do with such a jigsaw, but Paul instantly recognized its quality and rarity. The only clue it bore as to its origin was, pasted onto the verso of the entablature, a 19th century railway sticker marked ‘Veneto’. This, coupled with some evidence from the auction sale, indicated that the frame might have travelled to London from northern Italy, and might once have belonged in the collection of the Victoria & Albert Museum. This was at first all we could discover of its history. At the time, I knew only two things about the frame. First, that it was timelessly beautiful, and still in its original untouched condition; and second, that it had once formed the setting for an elaborate altarpiece composed of a number of panel paintings. But it appeared to have created no discernible pathway through time, no long history of origin and ownership. Slowly the investigation ground to a halt. I had started by inquiring of various Renaissance scholars as to the feasibility of tracking down the paintings. The response was usually either a snigger or a shrug. A few were more encouraging: individual paintings from such altarpieces are, after all, scattered all over the world. But this also complicated the process – it was like searching for a needle in a dozen haystacks. In the sixty years that Paul Levi had been in the business, he had rarely been able to reunite a frame with its original painting. What made me think that I could find as many as eleven paintings for an empty frame? He must have hoped, however, that something good would come of my quest. 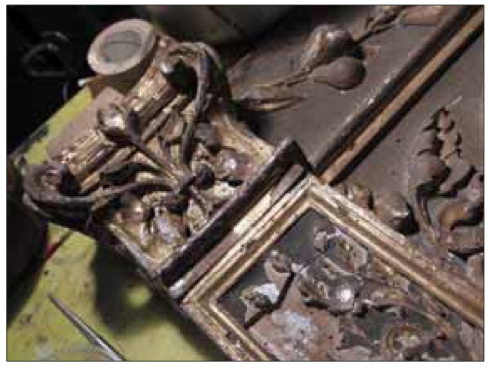 Many small pieces of ornament had to be repaired, replaced, or restored. The repaired areas here have yet to be finished. Wanting to live up to his confidence in me, I went to the best sources I knew of for information on this arcane subject: the Getty Research Institute in California; the Villa I Tatti, in Florence; the National Gallery of Art in Washington DC; and others, too, as time and money permitted. I learnt a lot, but every time I thought that I was onto something which might illuminate the history of the frame, it always led to a dead end. Years passed without any success. When we think of the many empty frames sitting in basements or attics in almost every museum in the world, it staggers the mind. Where are all the paintings from these unwanted treasures? Some of these frames may be recycled for another painting, with a little adjustment to the sight edge; some may be enlarged or reduced in size, with the alterations cleverly concealed by an adroit artisan. Surfaces may be regilded or simply covered with radiator paint to freshen them, or they may be given a white-wash to obtain the ’50s look of bleached driftwood. All of the above can be justified under the general maxim of ‘Let’s recycle’. There are so many precedents for taking liberties with these discarded relics in order to re-use them, and this might have been the fate of our own frame —until we finally traced its history. During those years when nothing could be discovered, several opportunities arrived when the frame might very nearly have been reconfigured to fit a different work. The first came when the National Gallery of Art, Washington, needed to frame Bellini’s and Titian’s Feast of the Gods. This had originally been a mural, and was roughly the same period as our polyptych. The latter would have had to be to be cut down and altered to fit the painting: not an easy job, but feasible. The idea of another life for the frame was a better prospect than to have it languishing in our warehouse, forever unappreciated by the public; at least it would be seen and valued. This proposal was not accepted, however, as the painting had too many secular connotations for the frame, the whole process would have been difficult and expensive, and the frame selection committee could not be reconciled to the aesthetic incongruities of such a marriage. A second opportunity came to reuse the frame when the National Cathedral in Washington was designing a chapel of meditation: the polyptych was considered as a contemplative object devoid of paintings with just fabric inserts to fill the negative space. The committee rejected the proposal in favour of a Plexiglas sculpture of folded hands, spotlit in the darkened room. 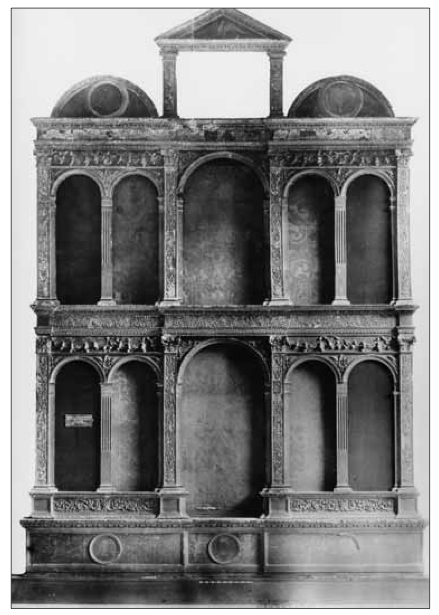 The third opportunity came when a private client, who was constructing a chapel in Santa Fe, suggested that there was enough space for the polyptych to be hung at one end of the church; however, in the end it was decided to keep the design simple and austere. The frame was too ornamental for a simple adobe structure. Sometimes in life we are discouraged by rejections, especially after a lot of work has gone into the preparation of proposals; however, as the Dalai Lama says, ‘Remember that not getting what you want is sometimes a brilliant stroke of luck’ . In 2001 our research team began preparations for an exhibition of Italian aedicules called Vero e falso – ‘True or false’. This was a display of about a dozen frames ranging from original 15th century examples to modern replicas. The idea for this exhibition originated with Dott. Marilena Mosco, an expert on Italian Mannerist and Baroque frames, and at that point director of the Museo degli Argenti e Porcellane, Palazzo Pitti, in Florence. We naturally wanted to include the polyptych in this exhibition, so we retrieved it from its resting place and reassembled the fourteen pieces. This was the first time that the frame had been completely assembled since we received it, and, when we saw the whole splendid structure – 16 feet high and almost 12 feet across – we felt renewed faith in the project. Its conception, design, and condition were all breathtaking. Having focused on the frame and its provenance once again, I remembered a hunch I had never had time to pursue. London’s Victoria & Albert Museum is one of the world’s great repositories of the decorative arts, and the fact that Paul Levi had mentioned the museum as a possible source intrigued me. The hunt was on again: but this time we would be looking for a putative file for the frame in the bowels of the museum’s archive… I took up my research again, and one day, as I was looking through the literature on the decorative arts, I discovered a work called The treasury of ornamental art by John Charles Robinson . Robinson had been the second curator of the V & A after its builder, Henry Cole; he had been employed in 1853, when he was twenty-nine, and had ‘a profound understanding of the Renaissance’, as well as a knowledge of ornament and the decorative arts. He and Cole travelled across Europe, acquiring items which had fallen victim to the modernizing of church interiors and city buildings: he assembled ‘a collection of Italian Renaissance sculpture, majolica, metalwork, textiles, and furniture that remains unmatched’. His book and his career together gave me the idea of looking for something with his name on it, or at least of examining the acquisition books produced under his aegis during the last quarter of the 19th century. I couldn’t spare the time to do this, but Jennifer Janicki, my co-curator, and her assistant, my daughter Annie, travelled to London to search the archive for clues. In the 1880s the frame was displayed in the V & A, London, with fabric inserts where the paintings would have been. Photo courtesy of the Victoria & Albert Museum Picture Library. It was a dreary and inauspicious day in London for such an expedition, but they hoped that perhaps they might be able crack the mystery there. They began with the 1875 acquisition book, and methodically went through the files one by one searching for any shred of evidence of the great frame. And after a third day in the basement in what was virtually solitary confinement, they had their reward. There, in the 1884 folder, was a file which outlined the entire acquisition process for our frame – the people involved, the bargaining, the rejection of two of the paintings offered with the frame, the final price, the shipping – the whole story, complete with the name of the artist, Filippo Mazzola, and the possible location of the other nine paintings. The place of origin of the polyptych turned out to be a small town in northern Italy between Parma and Piacenza, called Cortemaggiore. And so Annie’s next destination was Italy! 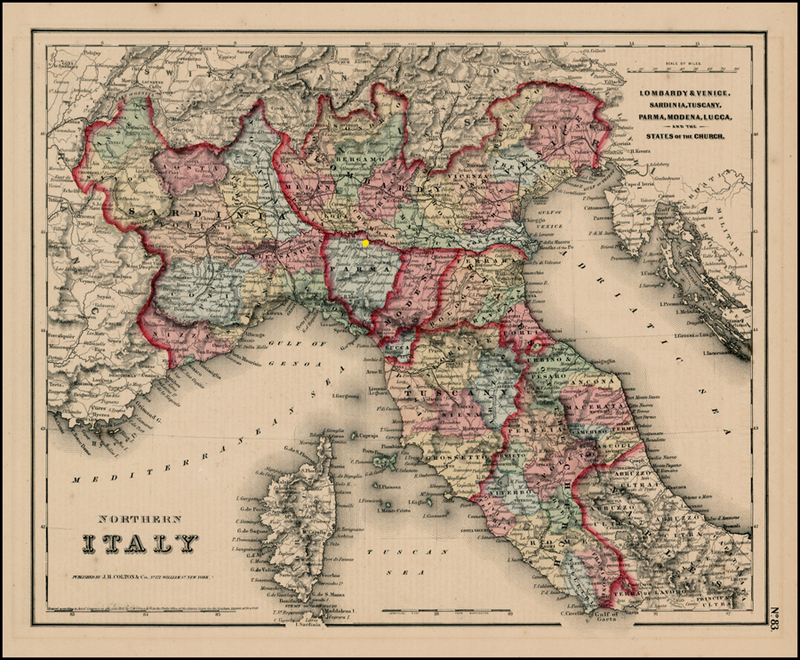 A map of northern Italy, with the town of Cortemaggiore marked in yellow: Barry Lawrence Ruderman Antique Maps Inc.
Santa Maria delle Grazie, Cortemaggiore; the original home of the polyptych. It was clear that the road to success was still eluding us; here was another door opening onto a dead end. Well, Annie had done all she could possibly do up to this point and she thought reluctantly that she must give up what seemed to be turning into another wild goose chase. But before getting on the road again, she went to the tobacco shop next door to the church to get a few things for the journey back. The clerk asked what she was doing in the town, and she related the whole saga, at which he exclaimed, ‘The paintings you’re looking for are in the National Museum in Parma, and my good friend, Edigio Bandini, a local historian, documented them before the museum took them for safekeeping!’ Bingo! Next destination: Parma. 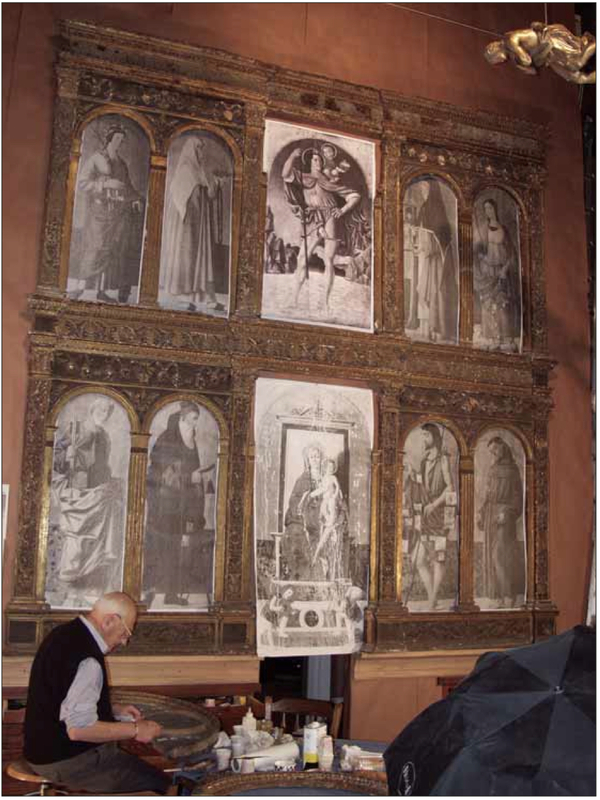 Before the polyptych frame and its panels were reunited, reproductions of Mazzola’s paintings hung in the church in Gothic revival frames. Photo courtesy of Egidio Bandini. In the museum in Parma the curator, Davide Gasparotto, listened patiently to Annie’s story and confirmed that our polyptych frame must indeed belong to the set of paintings from Cortemaggiore. 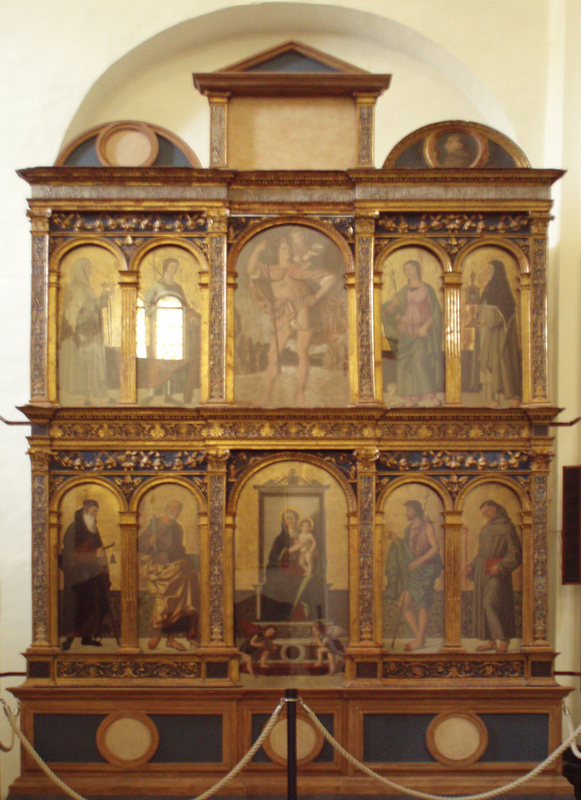 It had been constructed to hold a total of eleven paintings of various sizes, and had been mounted on the high altar of the church of Santa Maria delle Grazie. It once enshrined a holy relic (one thorn from Christ’s crown of thorns, now missing), which had been given to the church by the King of France. The paintings had been executed by Filippo Mazzola, the father of the more famous Parmigianino. Over time, the paintings were dispersed to two museums and the frame sold to the V & A. The panels in the museum at Parma were currently in the museum’s conservation department – in fact, some of them had already been restored and were on display in the museum. They would be reinstated in the church if funding could be obtained for the micro-climatic system needed to protect them from humidity and temperature fluctuation . The main question Gasparotto wanted to have answered was, ‘How much will it cost to get the frame back?’ So many paintings and other treasures have been taken from Italy over the years; Napoleon was one of the guiltiest, in this context, but collectors from all over the world have bought objets d’art from poverty-stricken villages, convents and churches. Returning this lost Italian patrimony to its place of origin is a longstanding goal of the Italian people. When Annie returned from her successful mission, we related the story to Paul Levi, who was still the owner of the frame. He responded that he would like to donate it to Cortemaggiore, so long as it would be displayed in the church where it had been installed in 1499, and, most emphatically, so long as the surface would not be tampered with for cosmetic purposes after its conservation treatment at Gold Leaf Studios. This generous offer could scarcely be believed by the church. The priest was so excited that he wanted to build a statue to Paul in the town square! But – almost better than that – the Italian government awarded Paul a Knighthood of the Republic, the highest award any non-Italian can receive for outstanding contributions to the Italian nation. Following our successful discovery of the Cortemaggiore paintings, and with the repatriation of the frame under weigh, we were faced with an overwhelming amount of work to do in time for the rededication of the whole polyptych in the spring of 2003. 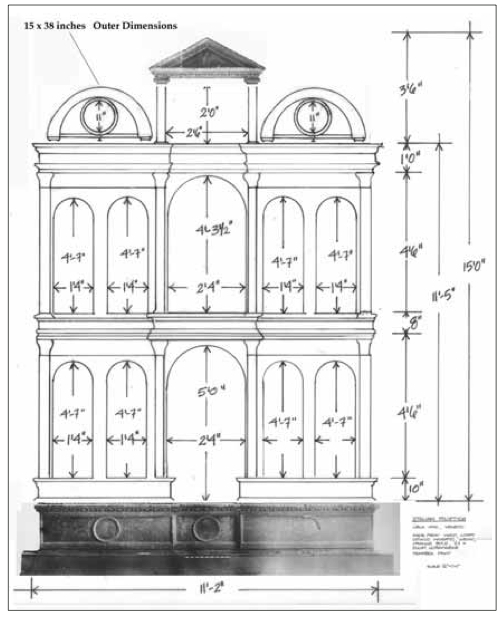 A great deal of work had to be completed in order to ready the massive frame for its return to Italy: the reconstruction of missing ornamentation, cleaning of the surface dirt, and consolidation of loose and flaking gesso. The staff of Gold Leaf Studios and a host of other conservator friends combined to deal with everything that needed to be done, and Paul Levi arrived from London to direct the conservation efforts. With his help we were able to develop a detailed plan for all the phases of the work. This was an important step for us, as his many years of experience proved to be essential for the work to follow. He was adamant that we should follow a path of minimal intervention, and in addition to his advice on how not to ruin the frame with overzealous cleaning, he provided essential moral support for the hundreds of hours of painstaking work that were to follow in the ensuing months. The frame had never been regilded, which was the curse of many similar objects from this period, and the blue background had suffered nothing but a little oxidization, which is normal for an object of such an age. Paul Levi’s decision to donate the frame to the Church College of Cortemaggiore in Italy inspired us to donate our time for the conservation, which, in turn, miraculously inspired other conservators to volunteer their time to help with the project. 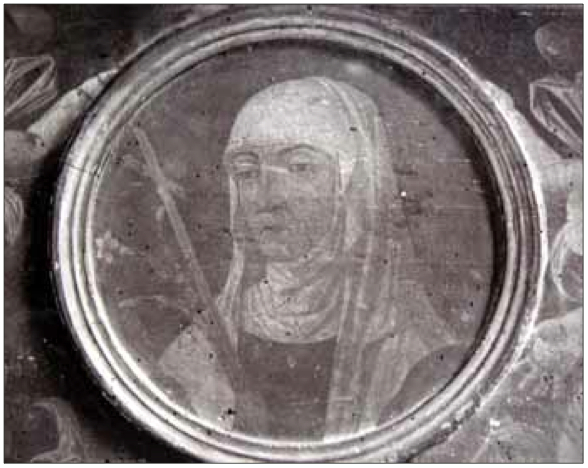 Marina Ginanni was instrumental in guiding the efforts at consolidating the surface of the frame . Her training in the treatment of polychrome sculpture and panel paintings was critical in establishing an effective methodology to hold the loose and flaking gesso together without compromising the integrity of the ancient surface. Our attempts to consolidate the gesso by using a new synthetic adhesive, Aquazol, had been unsuccessful, as the adhesive proved to be difficult to regulate; so by Marina’s advice we reverted to a more familiar and traditional adhesive, sturgeon’s bladder glue. This is obtained from the swimming bladder of the Russian sturgeon and is almost as rare as caviar, but its consolidation properties are well-recognized in the conservation field. In addition to this pervasive and inherent problem of surface flaking, there were numerous areas of ornamentation completely missing. 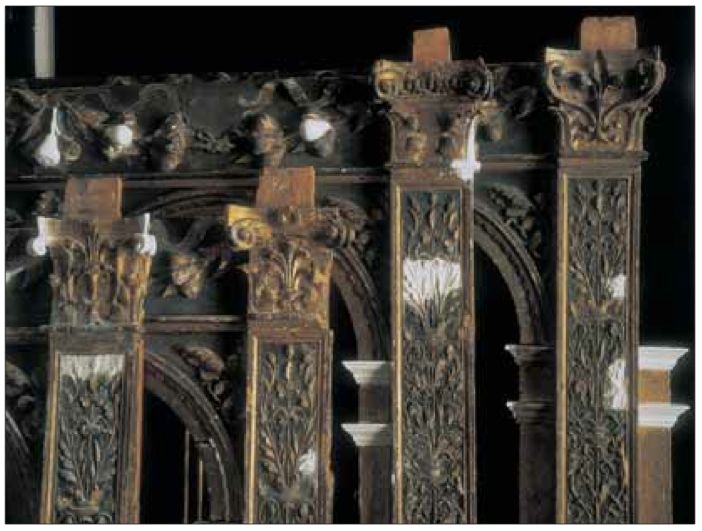 Replacements in carved limewood (bass wood) were used for some pieces, such as the cornice returns, the outermost volutes on the capitols, and the egg-&-dart moulding on the bottom left side of the lower lunette. As well as labour-intensive carving, we also used moulds taken from uninjured areas – such the urns and tendrils on the pilasters, and the anthemion pattern on both the friezes – and cast them in hydrocal . In the opinion of Paul Levi, the frame was in need only of a light cleaning with no solvents. I proudly pointed to an area that I had treated prior to his arrival with a cotton bud and organic enzymes . He admonished me, and said that this cleaning test had removed the patina and created too much contrast. He added that a frame of this age, coated in five hundred years of natural dirt, should be simply dry-cleaned with a brush. Taking a white hogshair brush with soft yet firm bristles, he proceeded to sweep it gently in circular motions to remove the layers of soot and grime accumulated from centuries of falling dust and burning candles. This was a new approach for me; it removed the dirt but left behind the patina of age. Soon the surface began to take on a life of its own, producing a subtle glimmering effect, without radically altering the overall appearance of the massive frame. This dry cleaning method was the most conservative approach I had ever attempted; but it worked! The accumulated dust had taken its toll on the once pristine blue and gold surfaces, which were now darkened; yet the giant frame had a quality of depth and lustre unmatched by any artificial patina I had seen. The key to success here lay in finding a balance between the disparate surfaces, and we achieved this, too, through dry-brushing, with most of the effort concentrated on the darker areas of the frame. In some parts – for instance at the base, where the dust lay a quarter of an inch thick – there was no gold left at all. 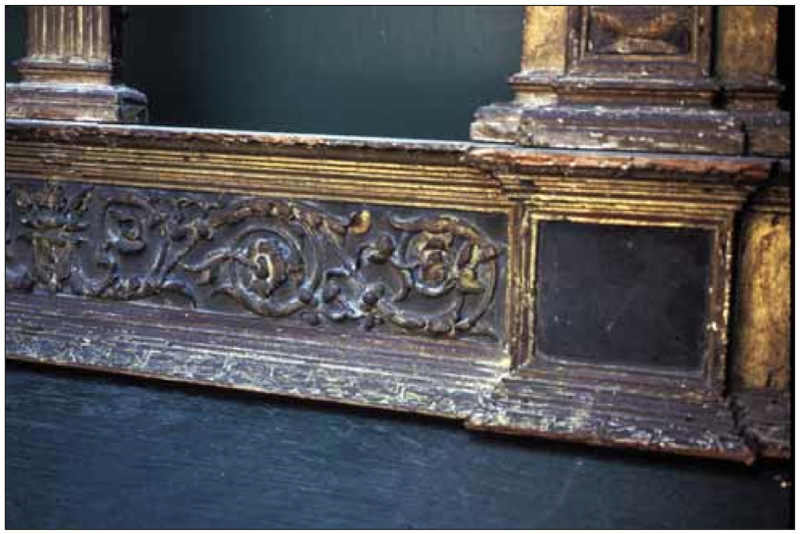 After the accumulated dust had been removed, Paul felt that the frame was in an ideal and natural state, and should be left alone – neither being regilded nor ‘improved’ in any way in the future. Jennifer Janicki & William Adair making good some losses with watercolour & dry pigments. After hundreds of hours of work, we finished our part and shipped the frame back to Italy, where the final work of conservation was completed by Valeria Fretta and Christina Gaibazzi of Laboratoria Ma. Ni, Parma. It would then be reunited with the paintings once again, in its original church. It was a good feeling to know that we had participated in this miracle of Cortemaggiore. Who knew what other miracles might lie ahead? I followed the frame to Cortemaggiore, arriving at about 9.00 p.m. after a long day’s travelling from America. I met Paul Levi and the priest of Santa Maria delle Grazie, monsignor Luigi Ghidoni, at the local restaurant, where we discussed the programme for the next day. 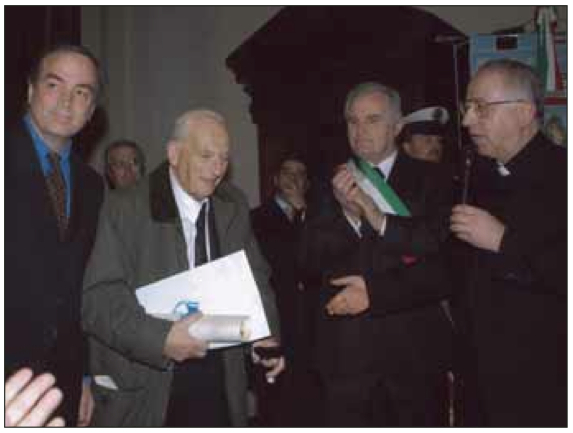 Monsignor Ghidoni welcomed Paul and me as his guests of honour – since it was, in effect, he who had catalyzed the whole project. 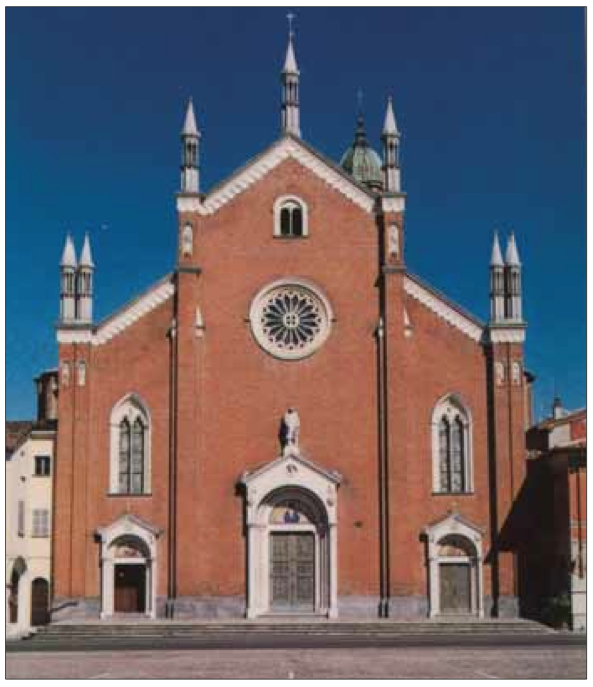 He had supported Paul’s request that the frame be put back in the church where it came from, and not installed in the museum in Parma, where the remaining panel paintings had been kept since 1987. He told us the project was of great interest to many Italian art historians. 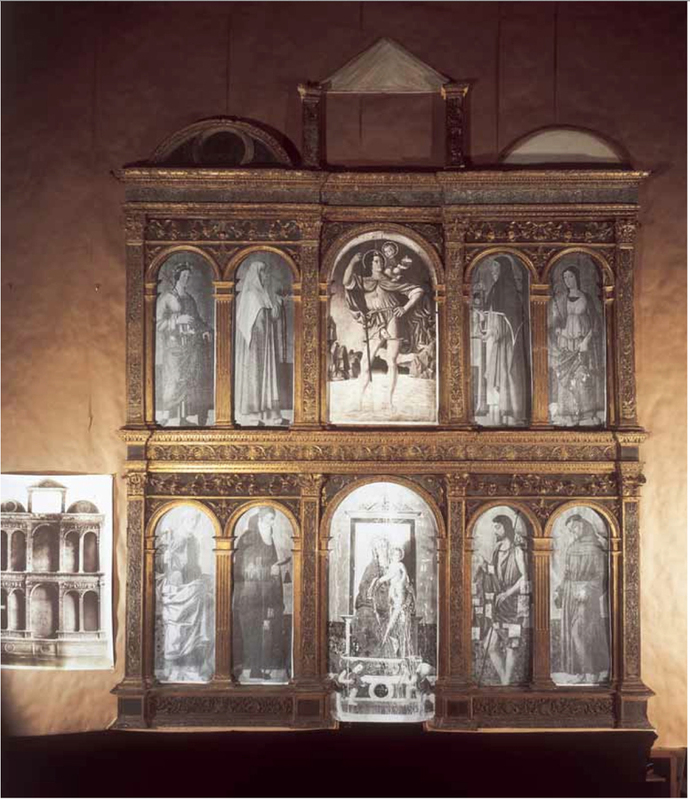 The local Banca di Piacenza, which had funded the micro-climatic system for the altarpiece, as as well as shipping and crating the frame, had produced a magnificent colour catalogue for the occasion. The directors of the bank would attend the rededication, as well as television and other journalists; and the Under Secretary for the ‘Biene Culturale’, Vittorio Scarbi, was to come with some special guests. In other words, this was a much larger event than Paul and I could have ever imagined. Even the UK government sent a representative from their Milan office as a gesture of appreciation to Paul. All was set for the unveiling the next day, March 22nd. We arrived at the church early to check the polyptych, which was covered with a blue cloth. The outside of the church was ringed with bright yellow tents serving prosecco and wheels of local cheese. There was an atmosphere full of anticipation and happiness; the church was thronged with people, both parishioners and casual visitors. After all the speeches, Paul was asked to pull the cord, the veil slid away from the altarpiece, and the crowd gasped, cheered, and applauded. The town mayor, Gianluigi Repetti, presented Paul with a beautiful hand-written parchment scroll commemorating this event. When the blue veil fell from the giant frame, reunited with its paintings after more than a hundred years, it was the climax of a long, complicated journey for a small but important bit of art history. A few elements of the complete ensemble are still missing, but perhaps – with a little more luck and another small miracle – they too may be found. William B. Adair received a B.F.A. in Studio Art from the University of Maryland in 1972. For the next 10 years he worked for the Smithsonian Institution’s National Portrait Gallery as a museum conservator specializing in the treatment of picture frames. 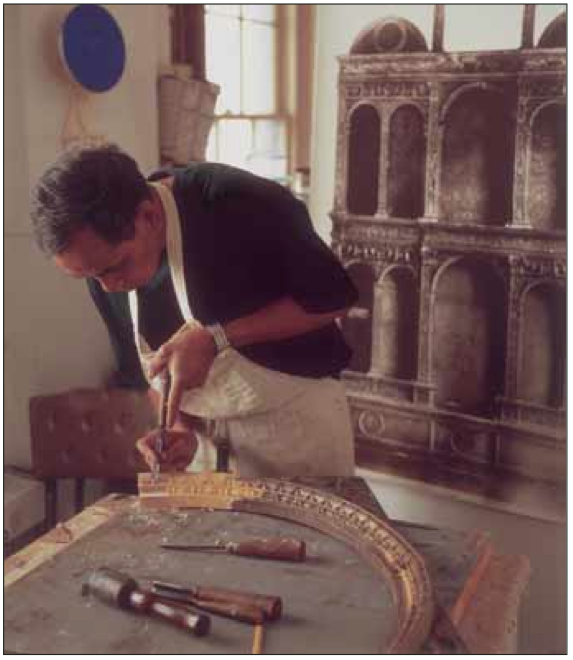 In 1982 he formed his own company, Gold Leaf Studios, for the making of frames and the conservation of gilded antiques. Over the years his clients have included the U.S. Department of State and the National Park Service. He is the founder of the International Institute for Frame Study, a non-profit archive dedicated to collecting and disseminating information on the history of frames. He can be reached via email at bill@goldleafstudios.com. All photos courtesy of Gold Leaf Studios, unless otherwise stated. A very happy Christmas from The Frame Blog! The term ‘polyptych’ refers to a group of paintings consisting of more than three individual panels (or, in modern works, canvases) which collectively form a single work of art. 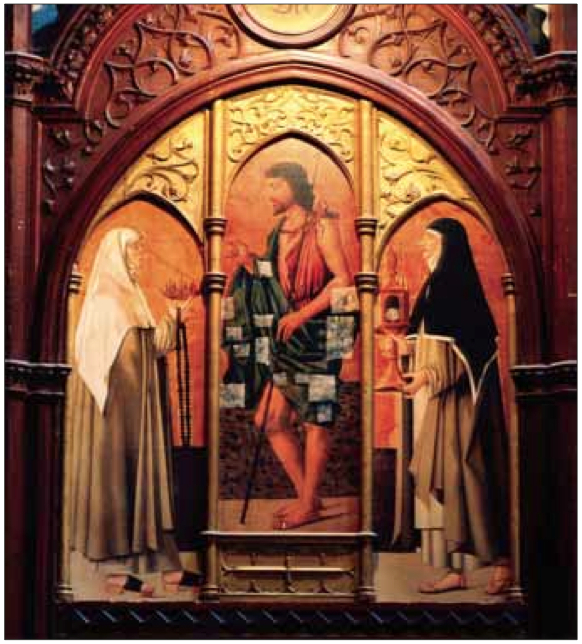 A triptych holds three paintings; a diptych has two. 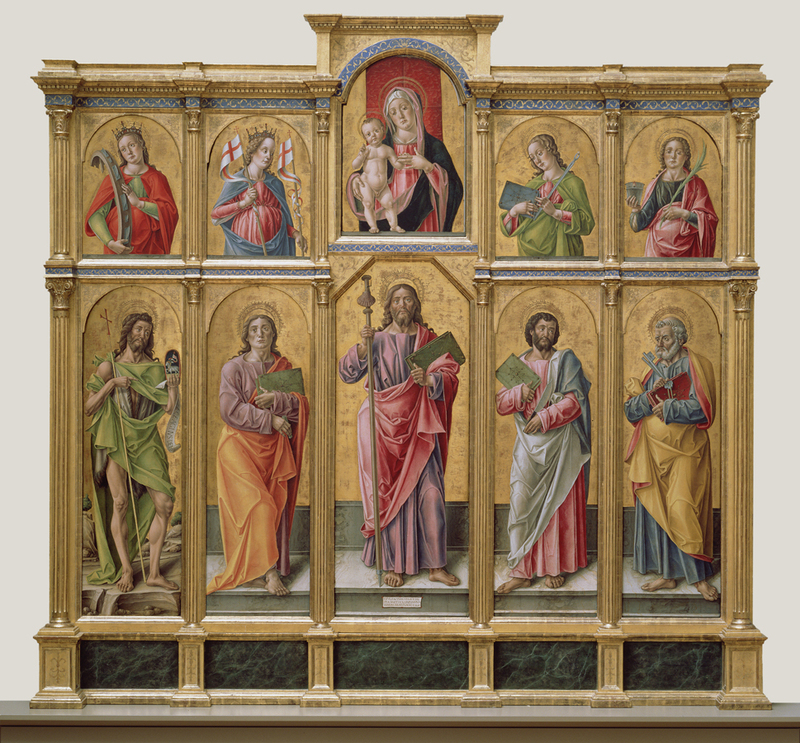 Many 15th century or earlier Italian paintings now in museums were once part of a polyptych, but have been removed from their altarpiece frames and sold individually. In the 19th century they were often placed in contemporary copies of their mediaeval or Renaissance frames. W.E. Coe & Sons, South Kensington Auction Rooms 79/85 Old Brompton Rd. The polyptych appeared as Lot 676 in Sale no. 2345, Antique and Modern Furniture, 16th August 1967, and was sold without a reserve. It was described as a ‘Large antique gilt wood chancel screen, having carved and moulded decoration and painted with circular portrait panel, etc., in fourteen sections’. 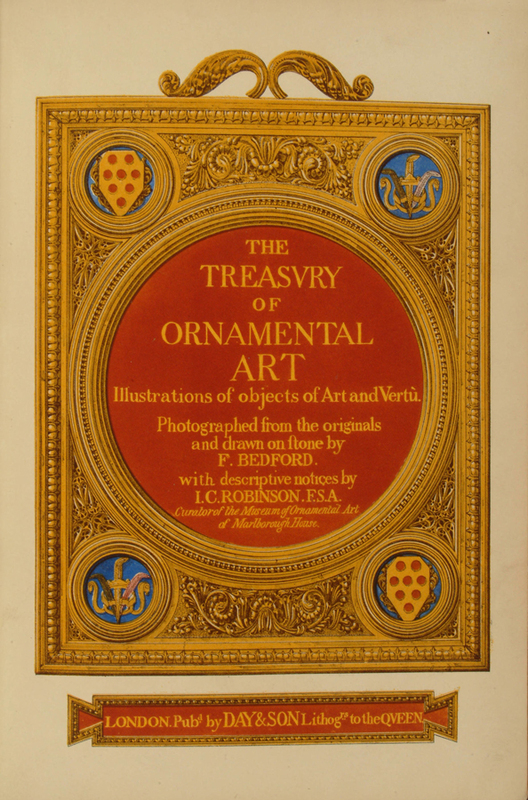 Sir John Charles Robinson, The Treasury of Ornamental Art, 1857. Charles Robinson (1824-1913), curator of the V & A, was a collector and a connoisseur. He began to study architecture, but turned to painting; during the 1840s he attended the studio of Michel-Martin Drolling in Paris, among others. He became an expert in early Italian drawings and sculpture, as well as in the decorative arts, including (like W. Bode) picture frames. In 1882, he was appointed Surveyor of the Queen’s Pictures, a post he retained until 1901. In 1883, while travelling in Italy, Robinson made more purchases for the museum and was involved in the acquisition of the polyptych. 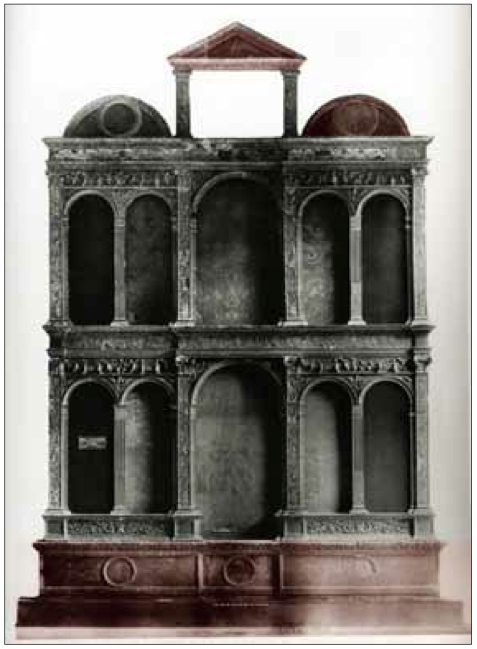 Timothy Stevens & Peter Trippi, ‘An encyclopaedia of treasures: The idea of the great collection’, from A grand design: A history of the Victoria & Albert Museum, 1997. Funding was obtained from the Banca Di Piacenza for this important aspect of the project, as well as the shipping, crating and insurance. Monsignor Ghidoni, Arciprete della Collegiata, was responsible for this and many other critical negotiations. Special thanks are due to Davide Gasparotto, curator, Parma National Museum. Aquazol is a reversible acrylic mixed with alcohol. It was effective in some larger areas of flaking – ¼ to ½ ins – but where smaller areas were in question, it was the fish glue which seemed to penetrate the nooks and crannies of the substrate and hold the flaking surface together. Alcohol was first injected to penetrate and prepare the surface for the subsequent application of hot fish glue. When the glue was applied, the surfaces drank it up like a sponge, pulling the glue underneath the fractured and dry gesso. The treated surface was then covered with wax paper, and a weight was applied to assert gentle pressure and compact the glue and gesso together. Hydrocal is a plaster of Paris-like material which is stronger and more durable than casting stone. 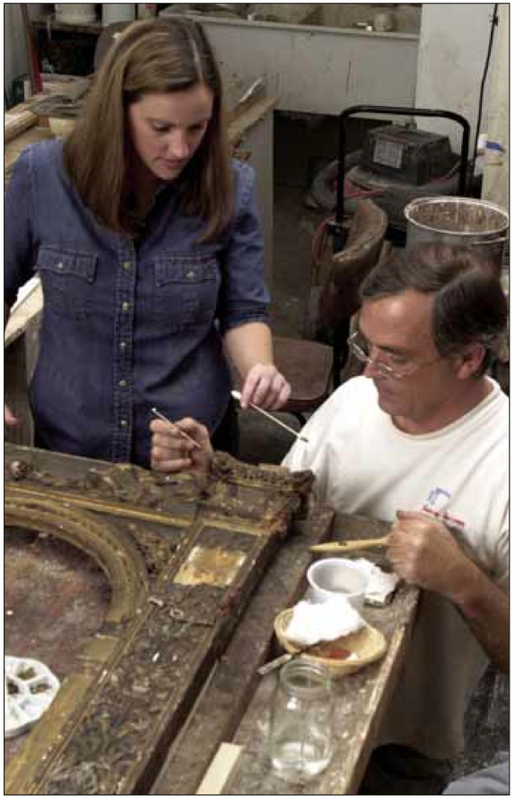 In addition, if properly coated, it will accept and retain all forms of gilding and finishing which may be applied to it. Organic enzymes are sometimes used by the conservator to loosen surface dirt in test cleaning to see how reactive the patina will be to a weak solvent.